DANBURY - In May, when Danbury was identified as the fastest-growing city in Connecticut, Mayor Mark Boughton said the challenges of growth were preferable to the challenges of decline, but they were still challenges. A new report appears to bear that out, revealing growing pains in a city that is noted for its low crime rate, its low unemployment rate and its affordable housing. A first-of-its-kind report.... gives Danbury poorer scores than Connecticut and Fairfield County as a whole in seven out of 12 categories that measure "community wellness." The report gives Danbury low scores for having a high percentage of pre-kindergarten kids who are not enrolled in school readiness programs, a high percentage of low-income children, a high percentage of people without bachelor’s degrees, a high percentage of people who feel financially insecure and a high percentage of part-time workers seeking full-time work — the "underemployed." Of the city’s scores the one that most concerns a leading developer of social service programs in Danbury is the number of preschool age kids who are not enrolled in school readiness programs. The report ranks Danbury last in Fairfield County with only 53 percent of 3- and 4-year-olds going to pre-Kindergarten classes, compared to 60 percent in Stamford, 62 percent in Bridgeport and 72 percent in Norwalk. "I am very concerned about that," said Kim Morgan, the chief executive officer of United Way of Western Connecticut. "The child care subsidy has been cut significantly, and it is only going to get worse with the (state) budget crisis. If we start to see problems with kindergarten readiness, that is a huge issue." The report's researchers spent 2015 and 2016 interviewing 5,000 Fairfield County residents and another 16,000 Connecticut residents statewide, incorporating the responses with state and federal data. The results are meant to help cities such as Danbury identify regional solutions to social problems. "One of the values of looking at this information across the region and the state is to identify needs that can’t be addressed on the local level," said Nancy von Euler, the vice president for programs at Fairfield County’s Community Foundation. "Part of the power of this study is bringing together people across the region whose fates are tied together." DataHaven and the Community Foundation had planned the first public presentation about the report last week in Danbury, but the event was postponed because of bad weather. The next presentation is planned for 6 p.m. Wednesday at Stamford's Ferguson Library. The 70-page report includes data showing Fairfield County’s population is getting older and more diverse. Stamford, Danbury and Bridgeport continue to outpace state and national trends for foreign-born residents. Fairfield County has the largest income inequity of any large metropolitan area in the country. The report attempts to understand the how conditions in the community affect people every day. Combining those responses with health and economic data, the study tried to show the relationship between quality of life, healthy lifestyles and economic competitiveness. The score for Danbury was better only than Bridgeport and Stratford when it came to the report’s index of "personal wellbeing." Connecticut and Fairfield County as a whole scored higher, the report said. The score for Danbury on the separate community index was better only than Bridgeport among Fairfield County communities, the report said. The community wellbeing index was based on 12 categories that ranged from health to economic security. 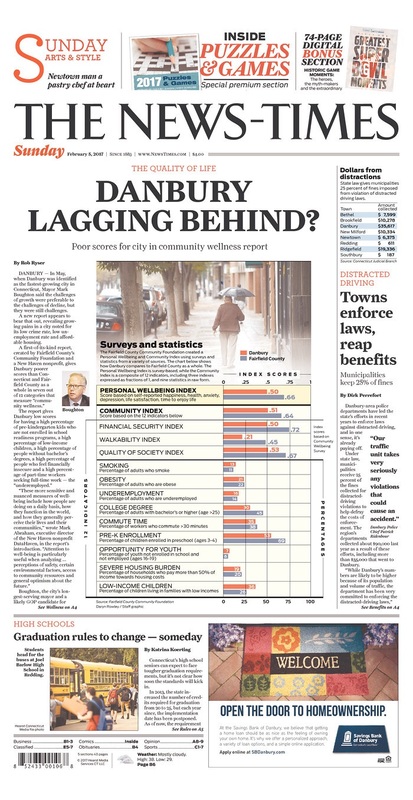 One category where Danbury scored low was called "walkability" - a measure of how close people are to stores and cultural attractions and how well sidewalks and bike trails are kept. Meanwhile, the United Way's Morgan said the organization is working with partners to secure a major grant for programs to help residents with language skills, child-care costs and finding transportation to work. "Danbury is a fantastic community to live and work in, and it should be our strength that we are diverse," Morgan said. "While it bring challenges, these are our opportunities to be creative, because we all have a responsibility to make every neighborhood the best place to live that it can be."